Mt. Hood Recreation - Skiing, snow boarding, biking and more. As the state’s highest peak, Mt. Hood offers visitors year-round recreational opportunities in a breathtaking, natural setting. Mt. Hood’s stunning top rises out of the sky to greet incoming air passengers, and provides a spectacular natural compass for the Northwest. Mt. Hood is the 4th tallest peak in the Cascade mountain range. Once an active volcano, the mountain has been relatively dormant since the arrival of Lewis and Clark in 1805. Minor eruptions were felt through the turn of the century, and while scientists cannot predict the next eruption, they estimate it will consist of small explosions and the growth and collapse of lava domes. With glaciers, rivers, waterfalls, and streams, Mt. Hood’s recreational opportunities include everything from golf, fishing, hiking, swimming, skiing, snowboarding, snowshoeing, and much more. Mt. 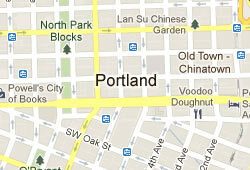 Hood is approximately 45 minutes from Hood River, one hour from Portland, and two hours from Salem. Just twenty miles east of Portland, Mt. Hood National Forest offers camping, hiking, mountain biking, horseback riding, fishing, kayaking, rafting, and more. The forest boundary extends south from the Columbia River Gorge (where thrill seekers brave the high winds to wind surf and kite board on Hood River), through sixty miles of treed mountains, lakes, and streams to the Olallie Scenic Area under the slopes of Mt. Jefferson. The forest encompasses more than one million acres, including 300,000 acres of designated wilderness. The largest is such area is the Mt. Hood Wilderness, which includes the mountain’s peak and upper slopes. Other designated areas are Clackamas, Lower White River, Roaring River, Badger Creek, Salmon-Huckleberry, Hatfield, and Bull-of-the-Woods. The Timberline Lodge attracts thousands of visitors each year. Built in 1937, the lodge is perhaps best recognized as the backdrop for the movie, The Shining. Timberline Lodge offers an array of dining options, including The Ram’s Head, Blue Ox Bar, The Cascade Dining Room, and Black Iron Grill & Market Café. The Resort at Mt. Hood offers golfing and casual dining. Mt. Hood Adventure Park (Ski Bowl) offers slides, bungee towers, mountain biking, rock climbing, kids’ adventure games, and much more. There are four ski resorts at Mt. Hood. Mt Hood Meadows is the largest ski resort on the mountain. Timberline Lodge is the only ski area in North America that’s open all year. Mt. Hood Ski Bowl is the country’s largest night ski area, and Copper Spur Mountain Resort has stunning views of Mt. Hood, Mt. Adams, and Mt. Ranier. Mt. Hood also offers countless trails for cross-country skiing and snowshoeing, including Trillium Lake Snowtrails, Teacup Lake, Mt. Hood Meadows Nordic Center, and Copper Spur Nordic Center. In addition to Timberline Lodge, Government Camp has pubs and restaurants, including Mt. Hood Brewing Company, Cascade Restaurant & Lounge, Charlie’s Mountain View, Multorpor Restaurant & Lounge, and Ratskeller.